The oral cavity is a port for entry of many diseases and presents several unique features which make it especially prone to occupational disease. 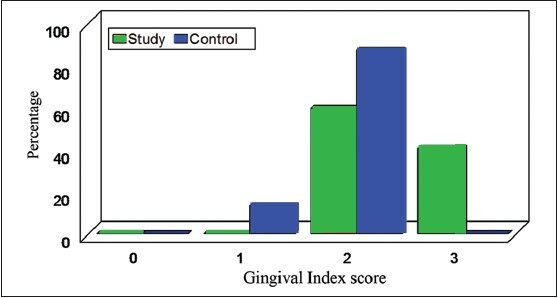 The various aspects of oral occupational disease can be analyzed on the basis of the structure affected like Instruments for prehension causes localized abrasion in cobblers, carpenters, glass blowers and due to variation in atmospheric pressure hemorrhage from gingivae can be seen in aviators. Oral cavity is more frequently exposed to injurious agents than any other organ or region of the body. It is usually unprotected except when masks are worn. Ingestion and inhalation of foreign substances that tend to stagnate and collect within the oral cavity lead to an accumulation of irritants of a chemical, physical or bacterial nature. To suggest remedial measures for improving the oral health status of the workers. A cross-sectional, comparative study was conducted to assess the oral health status of the battery factory workers in Kanpur city from February 26, 2010 to March 13, 2010. All required and relevant information regarding the battery factories of Kanpur city was collected from Uttar Pradesh Battery Udyog Association, Gadarianpurwa, Kanpur. The population of battery factory workers in Kanpur city is 3000, at 90% confidence level with an error allowance of 10% the sample size for the present study comes out to be 67. The sample size was calculated using sample size calculator. Though the sample size calculated was 67, for the purpose of the present study a total of 70 workers were enrolled from randomly selected battery factories. The battery units have two types of workers, that is, those exposed to acid fumes or mists (working in forming/charging departments) and those who are not exposed to acid fumes (working in grid casting, pasting, pressing and packing departments). Around 67.1% workers were exposed to acid and acid fumes or mists whereas the remaining one-third (32.9%) workers in the battery factories were involved in duties that did not have exposure to acid. The former comprised the study group while the latter comprised the control group of the present study. Prior permission was taken from the Indian Industries Association (IIA), Kanpur and owners of battery factories to conduct the oral examination of battery factory workers. Before starting the survey, the ethical clearance was obtained from the Institutional Ethical Committee of Rama Dental College, Hospital and Research Centre, Kanpur. The study group was duly informed about the purpose of the study and consent was taken from them before their participation in the study in order to prevent any inconvenience and to ensure full cooperation. Battery factory workers of all ages, available at the time of examination were included in the study. Those who were not willing to participate in the study. The examiner and recording assistant (pursuing internship training) was trained and calibrated in the Department of Preventive and Community Dentistry, Rama Dental College, Hospital and Research Centre, Kanpur, under the supervision of the staff members to prevent any diagnostic variability among the study subjects during the oral examinations. A detailed schedule of the survey was prepared well in advance. The investigator visited the study area during the prescheduled time frame in the study period, till the required sample size was obtained. Sufficient numbers of sterile instruments were made available for the examination during the study. The following instruments and materials were used for the study: Plane mouth mirrors, explorers, tweezers, kidney trays, containers (one for used instruments and the other for sterilized instruments), Betadine™ , saline, gauze and cotton with cotton holder, disposable gloves and mouth masks and data recording proforma. Clinical examination was done solely by the investigator with the study subjects seated on an ordinary chair using natural daylight. All the data was recorded by a recording assistant specially trained for the purpose. During the examination, the recording assistant was made to sit closely so that instructions and codes could be easily heard and repeated for confirmation. The interview and examination of a single subject took on average about 15 to 20 min. Those workers who needed immediate care for pain or infection were referred for immediate attention and further treatment. The raw data obtained was tabulated using the Microsoft Excel spreadsheet software (Microsoft). The data was analyzed using Statistical Package for Social Sciences (SPSS Inc., Chicago,IL, USA) version 15.0. Chi-square test is used to compare the categorical variables for proportions. Mann-Whitney U-test is used to compare the quantitative ordinal variables. Independent samples t-test is used to compare quantitative continuous variables. The study was conducted in battery factories of Kanpur city. As the battery units have two types of workers, the data was divided into two groups. Around one third (control group) workers in the battery factories were involved in duties that did not have direct exposure to acid whereas the remaining (study group) workers were working in the conditions that involved direct exposure to acid and acid fumes. Majority of workers in the control group were aged from 21 to 40 years (91.3%) while only 2 (8.7%) of control group subjects were aged above 40 years, whereas among study group there were 22/47 (46.9%) workers who were aged above 40 years. The difference was statistically significant (P = 0.014) [Figure 1]. All the workers surveyed were males with a mean age of 36.24 years. As compared to study group, in the control group the period of exposure was significantly lower (P < 0.001). 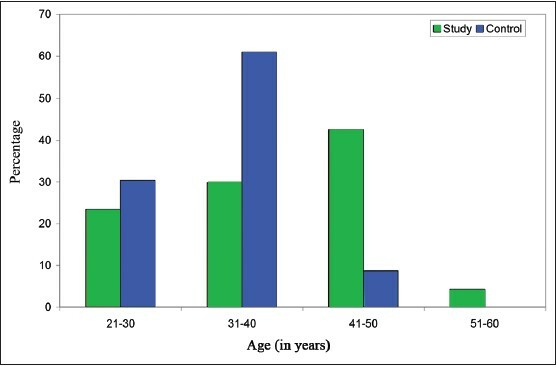 It was seen that in the control group more than two third (69.5%) respondents had up to 5 years of experience whereas in study group the period of exposure was more than 5 years in 89.3% subjects [Table 1]. The type of exposure amongst study group subjects was draft and unpleasant smell in all except around one-tenth (10.6%) subjects; however, in the control group it was chiefly the dust (91.3%). The difference was statistically significant about the type of exposure (P < 0.001) [Table 2]. As far as the oral symptoms were concerned, all the subjects in study group had some oral symptom present. 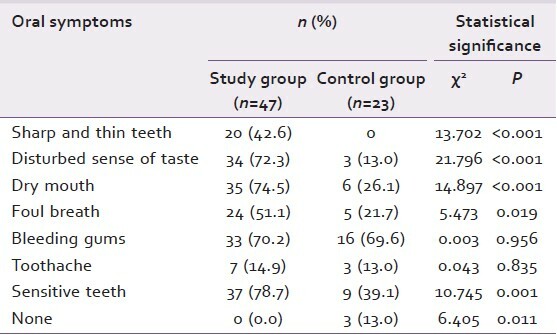 In study group sensitive teeth, sharp and thin teeth, disturbed sense of taste, dry mouth and foul breath were significantly higher as compared to the control group. No significant difference between two groups was seen regarding presence of bleeding gums and toothache [Table 3]. Majority of subjects in both the groups used toothpowder and finger that is 70.2% of study group and 69.6% of control group subjects. Toothbrush and toothpaste were being used by 10.6% of study and 17.4% of control group subjects only while toothpaste with finger was being used by 19.1% of study and 13.0% of control group subjects. Statistically, there was no significant difference in the method of oral hygiene between the two groups (P = 0.643) [Figure 2]. 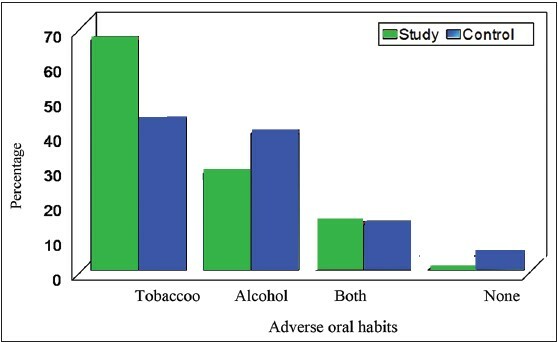 Tobacco consuming habit was proportionately higher in study group, and addiction to alcohol was higher among control group subjects, but the difference between two groups was not statistically significant (P = 0.332). Tobacco and alcohol in combination was distributed almost equally (12.8% and 13.0% respectively) in the two groups showing no statistically significant difference (P = 0.974). No adverse habit was seen in 1 (4.3%) subject of the control group only [Figure 3]. The study group shows decayed, missing and filled teeth with a mean of 2.43, 0.68, and 0.04 whereas control group subjects with a mean of 2.26, 0.57 and 0.13 respectively. No statistically significant difference between the two groups was seen in decayed-missing-filled (DMF) status [Table 4]. None of the subjects in study group had GI score of 0 or 1, 28 (59.6%) subjects had a GI score of 2 while the remaining 19 (40.4%) of the subjects had GI score of 3. In contrast in the control group, 3 (13%) subjects had GI score of 1 and the remaining 20 (87%) had GI score of 2. None of the subjects in the control group had a GI score of 0 or 3. On statistical comparison, a significant difference between two groups was seen (P < 0.001) [Figure 4]. None of the subjects in study group had erosion score of 0 as compared to control group where 14 (60.9%) subjects had erosion score of 0. Of the remaining 9 control subjects, 2 (8.7%) had erosion score of 1 while 7 (30.4%) had erosion score of 2. 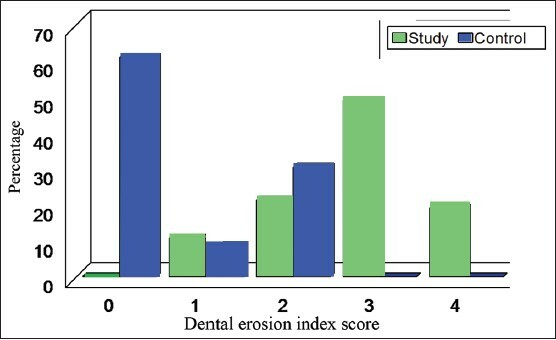 In contrast, almost half (48.9%) of the study subjects had erosion score of 3 and around one-fifth (19.1%) had erosion score of 4. Statistically, a significant difference was seen between the two groups (P < 0.001) [Figure 5]. None of the respondents in either group had OHI-S score of 0.0 or 0.1-1.2. Thirty-nine (83.0%) subjects in study group and 2 (8.7%) of the control group subjects had OHI-S score of 3.1-6.0. As compared to control group the OHI-S score of study group subjects was significantly higher (P < 0.001) [Figure 6]. Industrial erosion first affected the surfaces of the teeth most exposed to the atmosphere. These were the incisal one-third to one-half of the labial surfaces of the front teeth. No erosion of the posterior teeth was seen. Similar finding was seen by Malcolm and Paul in 1961. Study by Amin et al. in 2001 also showed that tooth surface loss caused by acid fumes confined to the labial surfaces of the upper anterior teeth, posterior teeth are protected by cheeks and lips which is in agreement with our study. Only the surface of the teeth uncovered by lips and cheeks is affected. The lips provides direct shield from the acid spray and also bathe the teeth with protective saliva. As compared to study group, in the control group the period of exposure was significantly lower (P < 0.001). It was seen that in the control group more than two-third (69.5%) respondents had up to 5 years of experience whereas in study group the period of exposure was more than 5 years in 89.3% subjects. Reason might be that the workers employed in direct exposure departments might have adequate experience. Previous studies ,,,, have suggested a relationship between the occurrence of dental erosion in acid workers and length of exposure which is in agreement with our study in which the proportion of subjects with erosion and severity of erosion increased with prolonged duration of exposure. The type of exposure amongst study group subjects was draft and unpleasant smell in all except around one-tenth (10.6%) subjects, however, in the control group it was chiefly dust (91.3%). In a study conducted by Petersen and Gormsen  in 1991, percentages of workers who reported exposure to an unpleasant smell was 84%, and vibration was 13% whereas in our study it was 55.3% and 8.7%. As far as the oral symptoms were concerned, all the subjects in study group had some oral symptom present. No significant difference between two groups was seen regarding presence of bleeding gums and toothache. Loss of the sense of taste or development of bad taste sensation was a common feature among acid workers in the study done by Amin et al. done in 2001 and the German survey  in 1991which is also a common feature with our study in which it is 72.3% among acid workers [Table 3]. This could be related to possible atrophic changes in the taste buds as a result of exposure to acid fumes in the workplace environment. Majority of respondents in both the groups used toothpowder and finger. Toothpaste with finger was being used by 19.1% of study and 13% of control subjects. Statistically, there was no significant difference in oral hygiene practices between the study and control groups (P = 0.643). The oral hygiene practice was poor (14% of acid workers and 25% of controls brushed their teeth) in the study conducted by Amin et al. which was in agreement with our study in which 10.6% of study group and 17.4% of control group workers used to brush their teeth. In our study, no statistically significant difference between the two groups was seen in DMF status and no evidence of any relation between DMF status and degree of erosion was seen which is in agreement to the study done by Malcolm and Paul  in 1961, Ten Bruggen Cate  in 1968 and Tuominen et al. in 1989. None of the respondents in study group had GI score of 0 or 1, 28 (59.6%) respondents had a GI score of 2 while the remaining 19 (40.4%) of the respondents had GI score of 3. In contrast in control group 3 (13%) respondents had GI score of 1, and the remaining 20 (87%) had GI score of 2. None of the respondents in the control group had a GI score of 0 or 3 [Figure 4]. In a survey on battery workers conducted by Amin et al.,  total of 79.2% of acid workers and 46.7% of controls showed erosion which was in agreement with our study in which all workers in study group and 39.1% in the control group had erosion. In their study, 62.5% of acid workers had grades 2 and 3 erosion, 16.7% had grade 4 erosion which was in agreement with our study in which 70.2% of study group had grades 2 and 3 erosion, and 19.1% had grade 4 erosion. In battery factories, exposure to sulphuric acid fumes in the work place was significantly associated with dental erosion and poor oral health status [Figure 6] among workers. Similar finding was suggested by Malcolm and Paul,  Ten Bruggen Cate,  Tuominen et al.,  and Petersen and Gormsen  which is in agreement with our study. Oral health status in battery factory workers was poor. The markedly better general and oral health conditions in the control groups composed to their acid exposed counterparts confirmed the association between deterioration of the oral health status and a hazardous workplace environment. Exposure to sulphuric acid fumes is significantly associated with deteriorated oral health status and dental erosion. Oral hygiene is an essential part of industrial hygiene. Adequate provisions for industrial health should include the prevention, the early recognition and the treatment of oral occupational diseases. Thus, oral health is more than additive or reducing factor in the production of oral occupational disease; it is a controlling factor. Providing medical and dental care services. 1. Schour I, Sarnat BG. Oral manifestations of occupational origin. JAMA 1942;12:1197-207. 2. Anfield BD, Warner CG. A study of industrial mists containing sulphuric acid. Ann Occup Hyg 1968;11:185-94. 3. Ellis P. Acid erosion in the teeth of industrial workers. J R Soc Promot Health 1963;3:163. 4. Pindborg JJ. Pathology of the Dental Hard Tissues. Copenhagen: Munksgaard Publishers; 1970. p. 1-445. 5. Järvinen VK, Rytömaa II, Heinonen OP. Risk factors in dental erosion. J Dent Res 1991;70:942-7. 6. Smith BG, Bartlett DW, Robb ND. The prevalence, etiology and management of tooth wear in the United Kingdom. J Prosthet Dent 1997;78:367-72. 7. Hattab FN, Yassin OM. Etiology and diagnosis of tooth wear: A literature review and presentation of selected cases. Int J Prosthodont 2000;13:101-7. 8. Tuominen ML, Tuominen RJ, Fubusa F, Mgalula N. Tooth surface loss and exposure to organic and inorganic acid fumes in workplace air. Community Dent Oral Epidemiol 1991;19:217-20. 9. Schroeder PL, Filler SJ, Ramirez B, Lazarchik DA, Vaezi MF, Richter JE. Dental erosion and acid reflux disease. Ann Intern Med 1995;122:809-15. 10. Ten Bruggen Cate HJ. Dental erosion in industry. Br J Ind Med 1968;25:249-66. 11. Tuominen M, Tuominen R, Ranta K, Ranta H. Association between acid fumes in the work environment and dental erosion. Scand J Work Environ Health 1989;15:335-8. 12. Remijn B, Koster P, Houthuijs D, Boleij J, Willems H, Brunekreef B, et al. Zinc chloride, zinc oxide, hydrochloric acid exposure and dental erosion in a zinc galvanizing plant in the Netherlands. Ann Occup Hyg 1982;25:299-307. 13. Petersen PE, Gormsen C. Oral conditions among German battery factory workers. Community Dent Oral Epidemiol 1991;19:104-6. 14. Erosion of the teeth by acid. Lancet 1980;2:353. 15. Wiegand A, Attin T. Occupational dental erosion from exposure to acids: A review. Occup Med (Lond) 2007;57:169-76. 16. Malcolm D, Paul E. Erosion of the teeth due to sulphuric acid in the battery industry. Br J Ind Med 1961;18:63-9. 17. Available from:http://www.macorr.com/ss_calculator.htm [Last Accessed on 2014 Mar 29]. 18. Smith BG, Knight JK. An index for measuring the wear of teeth. Br Dent J 1984 23;156:435-8. 19. Johansson AK, Johansson A, Birkhed D, Omar R, Baghdadi S, Carlsson GE. Dental erosion, soft-drink intake, and oral health in young Saudi men, and the development of a system for assessing erosive anterior tooth wear. Acta Odontol Scand 1996;54:369-78. 20. Greene JC, Vermillion JR. The Simplified oral hygiene index. J Am Dent Assoc 1964;68:7-13. 21. Loe H, Silness J. Periodontal disease in pregnancy. I. Prevalence and severity. Acta Odontol Scand 1963;21:533-51. 22. Oral health surveys. Basic methods. Geneva: World Health Organization; 1997. 23. Amin WM, Al-Omoush SA, Hattab FN. Oral health status of workers exposed to acid fumes in phosphate and battery industries in Jordan. Int Dent J 2001;51:169-74. 24. Milosevic A, Agrawal N, Redfearn P, Mair L. The occurrence of toothwear in users of Ecstasy (3,4-methylenedioxymethamphetamine). Community Dent Oral Epidemiol 1999;27:283-7. 25. Skogedal O, Silness J, Tangerud T, Laegreid O, Gilhuus-Moe O. Pilot study on dental erosion in a Norwegian electrolytic zinc factory. Community Dent Oral Epidemiol 1977;5:248-51. 26. Subramanian SV, Nandy S, Kelly M, Gordon D, Davey Smith G. Patterns and distribution of tobacco consumption in India: Cross sectional multilevel evidence from the 1998-9 national family health survey. BMJ 2004;328:801-6. 27. Edeer D, Martin CW. Occupational Dental Erosion. Richmond, BC: Work Safe BC Evidence Based Practice Group; 2010. p. 1-31. 28. Suyama Y, Takaku S, Okawa Y, Matsukubo T. Dental erosion in workers exposed to sulfuric acid in lead storage battery manufacturing facility. Bull Tokyo Dent Coll 2010;51:77-83. 29. Kim HD, Douglass CW. Associations between occupational health behaviors and occupational dental erosion. J Public Health Dent 2003;63:244-9. 30. Eccles JD. The treatment of dental erosion. J Dent 1978;6:217-21.